This tool has 5 laser settings: horizontal, vertical, vertical + horizontal crosshair, cross hair manual mode and locked cross hairs (for straight lines at any angle). With the laser on, I was immediately impressed with the brightness of the beam. The next thing I noticed was the wide angle of display. At five feet from the wall, the horizontal beam was visible nine feet in each direction. I had no problem using this in a 20 foot room in ambient light. Beyond that, the brightness drops off quickly. I've used this handy tool now on a variety of projects and have been very pleased with the amount of time it has saved me. One thing about any laser is that the level line goes on top of your work. A big advantage when installing wall tile. Normally, I would draw my layout lines and then start tiling over them, often obscuring them when I needed them most. With the projected laser line, it shines on top of the work, making it so easy to align the tile. I gave one of these units to my cabinet installer and he was able to lay out cabinets in a fraction of the usual time. For someone who isn't a pro, not only would this save them time, but it would help them to avoid common layout errors. I built a 12 foot long bench seat on an out-of-level floor. This tool made it easy for me to quickly determine the height of each stud to build a level seat. With the laser on, I simply placed my tape on the sole plate and marked my tape for each stud with a dry-erase marker where the laser crossed the tape. Then I just cut one stud for each marked height. Lasers are somewhat delicate and prone to being knocked out of level. I wouldn't recommend trying this, but I knocked mine off the countertop and it worked fine and was still accurate afterward. Overall, this tool seems reasonably rugged and comes with a rubber shroud to help protect it from bumps. One thing about using the horizontal level is that the laser itself can be tilted a maximum of 4 degrees before the line will blink, indicating that the line may not be level. Therefore, you must place this tool almost exactly at the height you want the line to appear. If you need to mark 7 feet 6 inches all around the room, for say, a picture rail, you would have to place the laser at about 7 feet 4.25 inches off the ground (the line is projected from 1.75" inches up from the base of the tool). Placing it on top of stepladder wouldn't work, unless it happens to be at exactly the height you need. Therefore, for most work, you will need to mount the laser on a tripod. Fortunately, it comes with a standard camera mount that will work with most tripods. For work close to the ground, I just set it on stacked plywood and lumber. Other uses include hanging paintings, drapery rods, crown moulding, trim moulding, squaring door frames and much much more. This laser has worked very well in our real-life tests and we would recommend to the professional as well as do-it-yourselfers. List price is about $129 and we found the street price to be just under a $100. 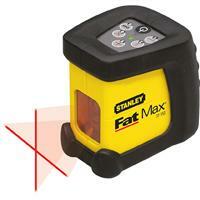 Have you used the Stanley Laser Level? How would you rate your overall satisfaction?